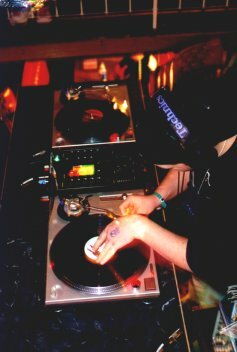 Arkansas DJ Service has become one of the most sought after and reputable entertainment service providers in Central Arkansas and surrounding States. All of our Karaoke Emcee's and DJ's are seasoned Professionals with hundreds of events Accredited to their names. Our Central Arkansas DJs and Karaoke DJs work, on the average, three to four events a week and have been professional disc jockeys and karaoke jockeys for many years in Central Arkansas and statewide. From a large corporate event party to an intimate private affair, Our Central Arkansas DJs and Karaoke DJs have a collection of over 80,000 songs to please every music listener and singer. Also, our DJs/Karaoke disc jockeys with their warm and friendly personalities are appreciated by all of our current and past clients. Arkansas DJ Service professionals are very experienced at motivating a large crowd and humble enough to just simply play background music. Arkansas DJ Service provides state-of-the-art equipment and professional DJ lighting that makes the music very inviting and gives a nice light show on the dance floor. Our mobile disc jockeys and karaoke DJs expertise will musically make your event the best it can be. Arkansas DJ Service is always upgrading equipment to keep ahead of the DJ entertainment industry standards. Along with a professional sound system, the light show adds dazzling effects and ambiance. We believe you'll like what we offer! Our significant music data base selection ranges from Big Band / 50's to Motown, Disco, Country & Western, Pop, Hip Hop and beyond. We are always adding to our already extensive Music Library. This way our Central Arkansas DJs can bring you and your guest the very best DJ entertainment in Arkansas. Music requests are always welcome. Not only do our Central Arkansas DJ's look professional, they are professional. The Master of Ceremonies at your event will have a wealth of experience. Our Disc Jockeys will always dress appropriately for each event. Our DJ knows what music to play, and how to get everyone on the dance floor, as well as keeping them on the dance floor. If you have any questions about any of our DJs give us a call or email us! "Little Rock Arkansas' Best Mobile DJ & Karaoke Service"